Currently taking residence in Lambesis studios in San Diego, Calif. with Killswitch Engage guitarist/ producer mastermind Adam D. and Daniel Castelman at the helm, As I Lay Dying are hard at work on their new album. The follow up to 2007's 'An Ocean Between Us' is not yet slated for an exact release date, but can be expected at some point next year. While the recording is underway, frontman Tim Lambesis offers an update on their work in progress: "There are only drums for eight songs tracked so far. One of them we're undecided about, but maybe it'll feel different when the vocals are done. Either way, we need [to] write more than eight songs (since they aren't as long as the eight songs on 'Master of Puppets')," jokes Lambesis. In addition to recording, the band has two quick one-off dates planned in Mexico City and Sri Lanka that Lambsesis cites as "two of the best shows of our career" and "the only break in working on the new album." 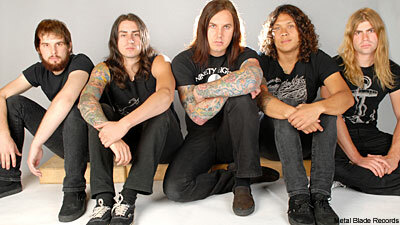 Acknowledging the break in time since their last album, Lambesis explains what's behind it, while expressing his gratitude to AILD's patient fans. "All of us can't stress enough how grateful we are to be writing music that we love while still receiving a paycheck. This can only be credited to OUR LOYAL FANS! Sometimes bands need to rush out a crappy record so they can start touring again to pay their bills. In our case, we plan to make a record worth listening to (hopefully), and start touring again when we're done. Thanks for your patience and understanding. We care and we're working."